LONDON, September 13. /TASS/. The UK’s Metropolitan Police is confident that Alexander Petrov and Ruslan Boshirov, whom London suspects of being involved in the Skripal poisoning, used aliases, the police told TASS, commenting on an interview the two gave to Russia’s RT TV channel. "We are aware of the statements made to Russian media by two men today, September 13. As we stated on September 5, two men known as ‘Alexander Petrov’ and ‘Ruslan Boshirov’ are wanted by UK police after the Crown Prosecution Service authorized charges against the pair, linked to the attack on Sergei and Yulia Skripal and Detective Sergeant Nick Bailey," a police official said. "We also stated that we believed they were using aliases and a European Arrest Warrant and Interpol Red Notices remain in circulation for the two men," the official added. The Met Police continues "to appeal to the public for any information regarding these two men whilst they were in the UK" on March 2-4. According to London, former Russian military intelligence (GRU) Colonel Sergei Skripal, 66, who had been convicted in Russia of spying for Great Britain and later swapped for Russian intelligence officers, and his daughter Yulia, 33, suffered the effects of an alleged nerve agent in the British city of Salisbury on March 4. Claiming that the substance used in the attack had been a Novichok-class nerve agent developed in the Soviet Union, London rushed to accuse Russia of being involved in the incident. Moscow rejected all of the United Kingdom’s accusations, saying that neither the Soviet Union nor Russia ever had any program aimed at developing such a substance. On September 5, British Prime Minister Theresa May informed the country’s parliament about the conclusions that investigators looking into the Salisbury incident had come to, saying that two Russians, believed to be GRU agents, were suspected of conspiracy to murder the Skripals. According to May, the assassination attempt was approved at "a senior level of the Russian state." 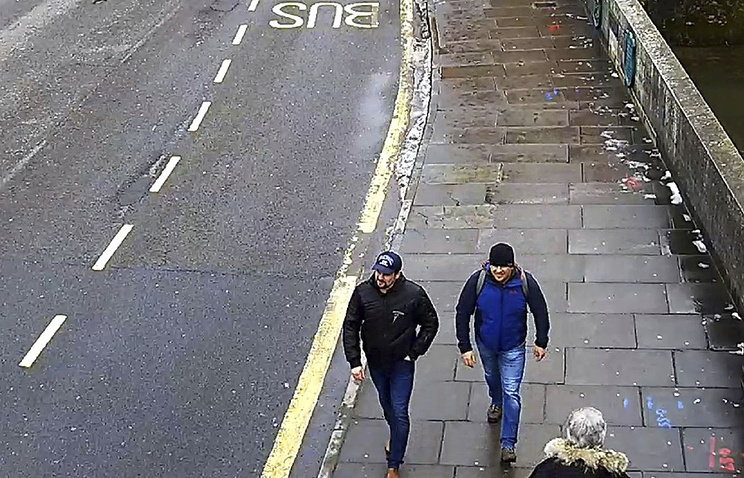 The Metropolitan Police published the suspects’ photos, saying their names were Alexander Petrov and Ruslan Boshirov. In an interview with Russia’s RT TV channel released on September 13, Petrov and Boshirov said they had visited Great Britain for tourist purposes. According to them, they are businessmen not linked to the GRU and have nothing to do with the Skripal case.